Mission MX5 review | What Hi-Fi? If there was a memo that said floorstanders for the UK need to be compact, Mission didn’t get it. The MX series range-toppers are massive, both in footprint and height, and in all but the largest rooms they’re going to be rather physically overbearing. Still, you’ll certainly feel like you’ve got your money’s worth with the MX5s, even if there’s nothing particularly fancy about their build. They do have a genuine three-way crossover, though, which passes frequencies to two 6in mid/bass drivers, a 6in woofer and a 25mm tweeter. And the MX5s really do pump out the jams. 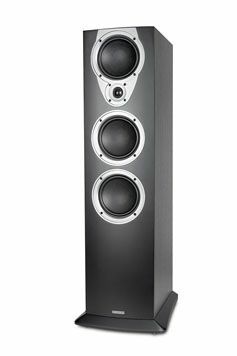 They go mighty loud, and the sound is as full-bodied as their girth suggests: they positively lap up the basslines from tracks such as Flobots’ Fight with Tools and James Blake’s almost subsonic Limit To Your Love. If you expect that weight to go hand in hand with sluggishness, though, you’ll be surprised. Some speakers are more agile, but switch to Blake’s The Wilhelm Scream, and the Missions prove adept at resolving the drums with sharp definition. There are, of course, imperfections, with Sufjan Steven’s Come On! Feel the Illinoise! proving that the MX5’s have their limits in terms of detail and organisation (although this does improve if you choose to bi-wire), as well as having a slightly rounded treble. However, these are minor flaws. If you’ve lots of space and like big audio without many of the usual big-speaker caveats, the Missions are great fun and greater value.